Olly Murs has said he's not planning marriage with his girlfriend of almost two years. The singer said he was taking it day by day with Francesca Thomas, and that they were "not rushing into anything". 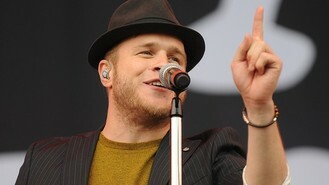 Olly told the Daily Mirror: "She's great. Of course we have our arguments, we have our disputes, happy times and bad times, but that's what relationships are all about. She keeps me grounded too. "I don't know what I see in the future yet. I've always been like that. I don't want to waste my life away predicting and thinking, 'Oh I'm going to get married next year, and then do this', because anything can happen in life." He added: "I want to make the most of every day. I just don't want to plan my life like that. I want to just see where it goes. "It shouldn't be, 'Oh my God we've been together a certain amount of time so we've got to move in together' - or have kids. And I don't like to do what other people expect me to do either!" Pete Doherty is back in rehab, this time in a Thai treatment centre where he is planning to set up a fund to help other addicts. Pete Doherty is back in a Thai rehab centre. Jason Orange may be embarking on a new career as a psychologist. Kelly Rowland has written a lullaby for her baby son. Anastacia has revealed how when she was diagnosed with breast cancer for the second time she immediately started writing songs for her latest album. Strictly Come Dancing is set to topple The X Factor in the singles chart. Sam Smith has said he doesn't want his sexuality to be a talking point. Noel Gallagher has admitted he is sceptical as to whether Russell Brand has the power to overthrow the Government. Russell Brand has made a spoof video to the tune of Blur's hit Parklife - in which he pokes fun at David Cameron and Nigel Farage.